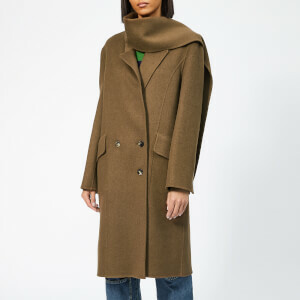 Women’s navy double-breasted coat from British fashion house, JW Anderson. Crafted from virgin wool and cut for a flared silhouette, the ‘Swing’ coat is designed with a cream shawl collar in soft merino wool which can be detached to reveal a notched lapel collar. The mid-thigh length coat is designed with a four-button fastening, side seam pockets and a martingale strap at the back for a gathered effect. Complete with a full internal lining and logo-engraved buttons throughout. Main: 100% Virgin Wool. Collar: 100% Merino Wool. Lining 1: 100% Cotton. Lining 2: 100% Polyester. Model is 170cm/5'7" and wears a size UK 8.